How many wins before a rider’s not considered second-best? Greipel wins! Take that pedals! 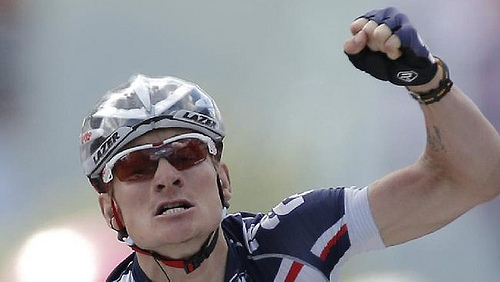 At one point Andre Greipel was the second-best sprinter at HTC-Columbia after Mark Cavendish. Then, for a long time, he was the second-best sprinter in the world after Mark Cavendish. More recently, he’s slipped a notch and has only been the second-best German sprinter after Marcel Kittel. But suddenly, in this year’s Tour, he’s winning. If there is such a thing as a yeoman sprinter, Greipel had become it. He’s actually won a Tour stage every year since 2011, but it increasingly seemed like he was the man lurking for when things went wrong for other people; that this was the only way he could win. You could argue that was what happened on stage two when those snot-nosed punks from Etixx-Quick Step left Mark Cavendish out in the wind like oh-so-much cheese. Stage five was different though. Stage five was messy, but Greipel still won. One win was in the script, but two out of two is something more. As for Cavendish, he does tend to improve as a Grand Tour goes on (at least relative to everyone else). He’ll be hoping that’s the case this year, although it’s worth noting that Alexander Kristoff boasts similarly resilient qualities and might prove to be a more significant rival later in the race. Did Peter Sagan notch yet another second place? Oh I do like the Tour de France to be beside the seaside – largely because there’s a very high likelihood of crosswinds.